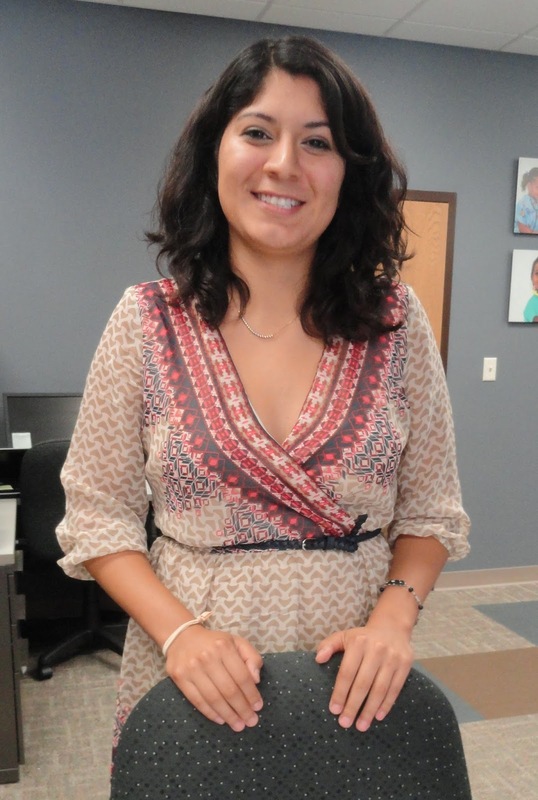 SIOUX CENTER – Stephanie Aguilar’s interest in health care was kindled by the biology aspect of how the body works and breaks down. But her interest spread during college from a focus on the medical aspect to an understanding of how social problems can be the root cause of many illnesses. care for patients who come into the health center. Stephanie – who graduated from Northwestern College in Orange City in May with a bachelor’s degree in translation and interpretation, with a focus on biology – will put that holistic approach for health care to daily use in her new role as a full-time family planning coordinator and outreach specialist at Promise Community Health Center in Sioux Center. While volunteering as an interpreter from time to time at Promise during college, she gained an appreciation for how Promise addresses the social causes of health problems and is culturally sensitive in all aspects of its care for people. Stephanie was born in Macon, GA, and grew up much of her life in Athens, TN. When she was a sophomore in high school, her family moved to Cherokee, where she graduated from Washington High School in 2011. She then enrolled at Northwestern College to receive a Christian higher education. She volunteered for a couple of years during college as an interpreter for Women, Infants and Children (WIC) clinics and on an on-call status at the Sioux County Jail in Orange City – in addition to helping out at Promise. Stephanie thinks her education and experience in interpretation and translation will make her a good fit for her position at Promise, which cares for many Spanish-speaking people. Promise Community Health Center, which is based in Sioux Center, is the only Federally Qualified Health Center in the far northwest corner of Iowa. Promise provides medical, prenatal, dental, vision and behavioral health services. To learn more, visit www.promisechc.org and watch this video. To read more Promise news visit, promisechcnews.blogspot.com. In her free time, Stephanie Aguilar enjoys socializing and having a cup of coffee. She also likes opportunities to get to know new people. SIOUX CENTER – Not all crime victims will give Family Crisis Centers a call or walk up to its doors to receive the help that they need. So the Sioux Center-based agency is taking its victim advocate services to where people from vulnerable populations may already feel comfortable going for care. reach to vulnerable people in northwest Iowa. Hofmeyer and FCC victim advocate Kelsey. Family Crisis Centers and Promise Community Health Center of Sioux Center have forged a partnership to place a full-time victim advocate in the health center – which has successfully reached out to and served many people from underserved populations in northwest Iowa since it opened in 2008. The project was made possible through a $235,000 federal grant awarded by the Iowa Attorney General’s Office from the Victims of Crime Act (VOCA) fund. Nancy Dykstra, executive director of Promise, thinks the project aligns well with the mission and vision of the health center. Kastein said the project stems from an attorney general’s office challenge that asked crime victim organizations to come up with new and innovative solutions to reach unserved and underserved populations. That prompted Kastein to reach out to Dykstra late last year to discuss a partnership and write the joint grant application. Here’s how the arrangement will work: Family Crisis Centers will provide the funding via the grant for the personnel and supplies for the program. Promise will provide the office space for the victim advocate and will refer people to her for services. Key questions will be developed for Promise staff to ask patients as a means to identify referrals. The victim advocate, who is trained as an interpreter for Spanish-speaking people, will assume her role at Promise on Monday, Aug. 1. After the template is developed and refined at Promise, Kastein said Family Crisis Centers will expand the project to Storm Lake and Carroll during the first year of the grant program. The program then might be eligible for two additional years of funding. Family Crisis Centers, which is based in Sioux Center, provides services to children and adults victimized by domestic violence and human trafficking in 17 Iowa counties and operates the statewide Iowa Domestic Violence Helpline 24 hours per day. To learn more, visit www.familycrisiscenters.org.